Best known for his ground breaking work in Extreme and currently touring with Rihanna, Nuno Bettencourt is a true guitar hero, inspiring millions of guitarists around the world. While primarily known for his electric work on his Washburn N4 signature guitar, Nuno and Extreme came to prominence with the acoustic hit, "More Than Words", which featured Nuno playing a Washburn Festival Series guitar. Nuno has continued to use Washburn Festival Series guitars on stage and studio to this day. It is with that spirit and desire to create the perfect stage and studio ready instrument that Washburn and Nuno teamed up to create the EA20SNB. 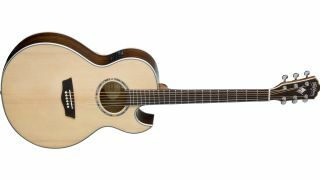 The guitar is a thinline jumbo style electro-acoustic with a Florentine cutaway for extended upper fret access. It features a book matched solid Alaskan Sitka spruce top with quarter sawn scalloped bracing and gorgeous book matched rosewood back and sides. A smooth satin finished mahogany neck offers the utmost playing comfort and is topped with a rosewood fingerboard which features custom 'Mourning Widow' inlays at the 12th fret. A bone nut and saddle provide ultimate tone transfer and chrome Grover 18:1 tuners provide ultra precise tuning and tuning stability. The unique soundhole rosette also features the 'Mourning Widow' motif. The EA20SNB is well suited to live performance due to its feedback reducing thin body and features Fishman Isys+ electronics for superb natural sounding amplified tone.